I have spent a lot of this week looking for my old Vikings, working on the Norman commission so this evening I decided I would do something just for me. 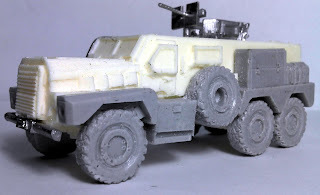 So out came the 20mm resin vehicles that arrived 3 or 4 weeks ago. 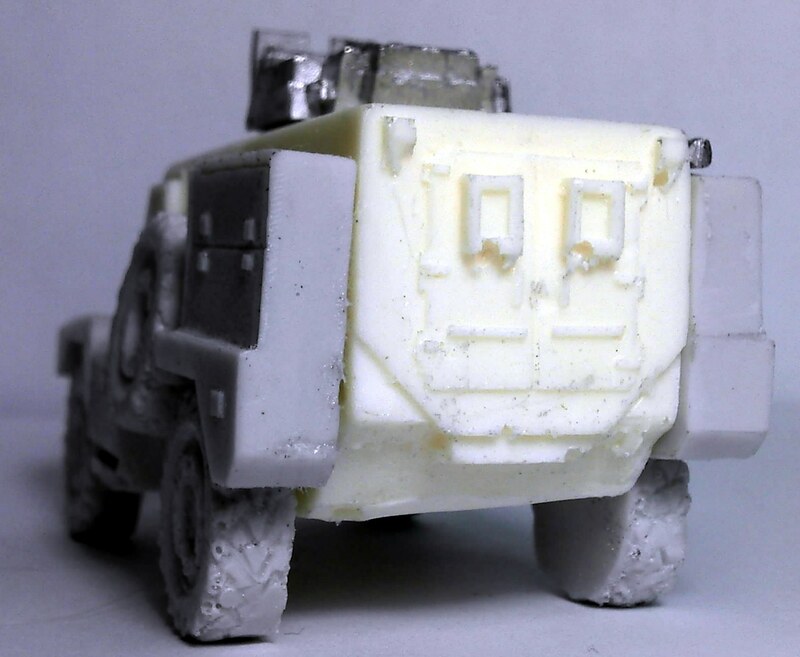 First up were the MRAPs from S&S Models. I really like the smaller 4x4 version, it has a chunky feel that really appeals to me. The 6x6 version kind of seems like a stretched Limo. The main bodies were cast in a different resin from the wheel panels and they come along with some nice white metal detail parts. Assembly is straight forward. I was disappointed with the large number of air bubbles that will need to be filled on both vehicles. I also assembled S&S Models Russian Sedan (I'm not sure what its called). 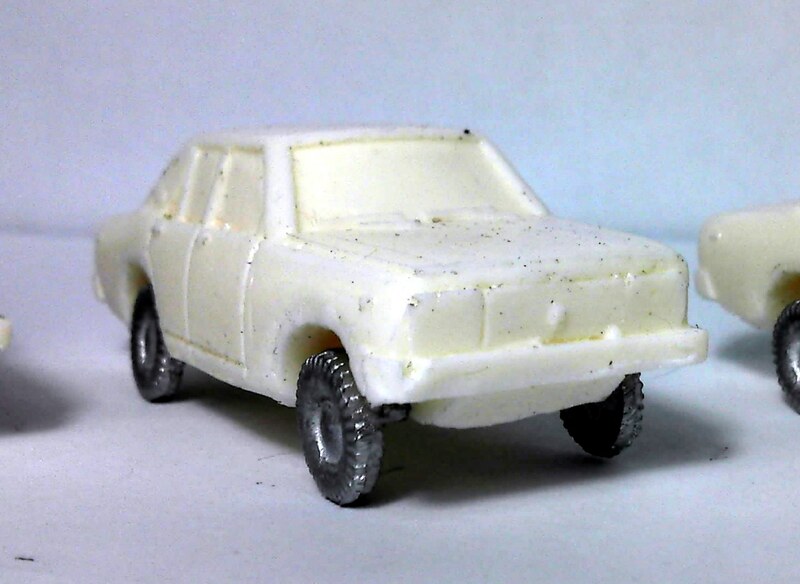 Solid resin body with white metal wheels and again lots of air bubbles. I think I'm going to take some shots after I have finished filling the holes. I think these are going to paint up pretty nice, they are just going to need a little more work. 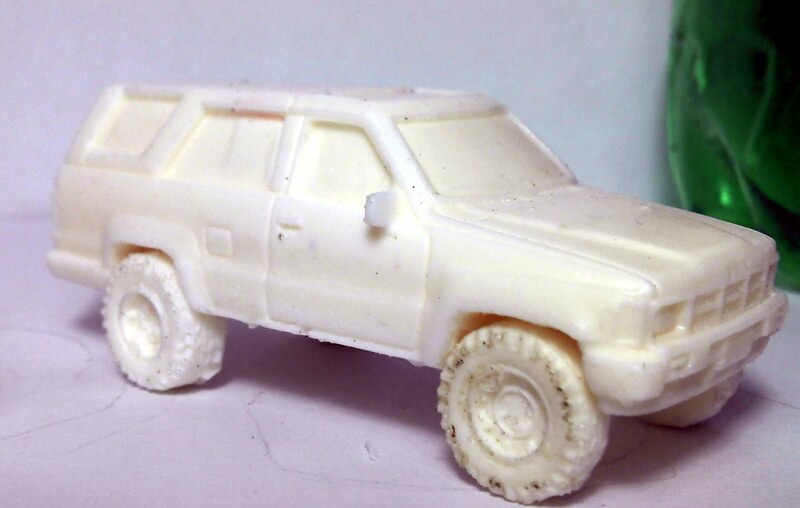 After that I put together the vehicles from the Hobby Den; a Mercedes, a Toyota SUV, a Land Rover and a pickup truck. 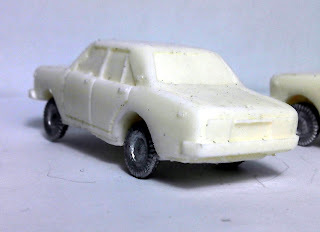 The bodies were much nicer on these although a little fill and finish work is still required. The wheels are all cast from resin and quite frankly are awful. Fortunately I'll be able to hide a good portion of them with mud. Can you tell what my favorite soda is from these pictures? If you have been reading this blog then you already know that I can be all over the map with my projects. I like to be able to go back and forth between periods just to break things up. My armies get done slower but it keeps my interest up. 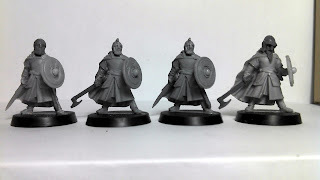 I spent some time working on one of the three warbands for my Rohan army for the September tournament. Since I'm unlikely to actually win the tournament through strength of arms I'm going for the painting win. This is an official GW tournament and as such there is straight forward checklist of items that a judge is looking for when he is judging the paint work on the armies. 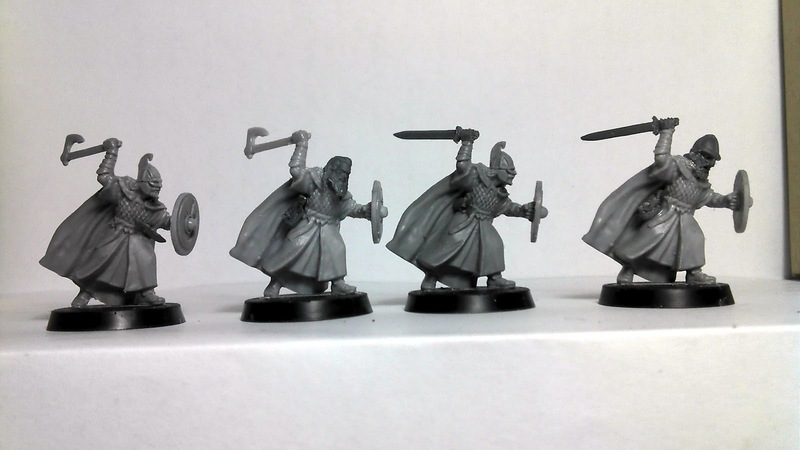 Conversions, even minor conversions, add huge points to your painting score, but there must be conversions on something like 90% of your army to get the check. 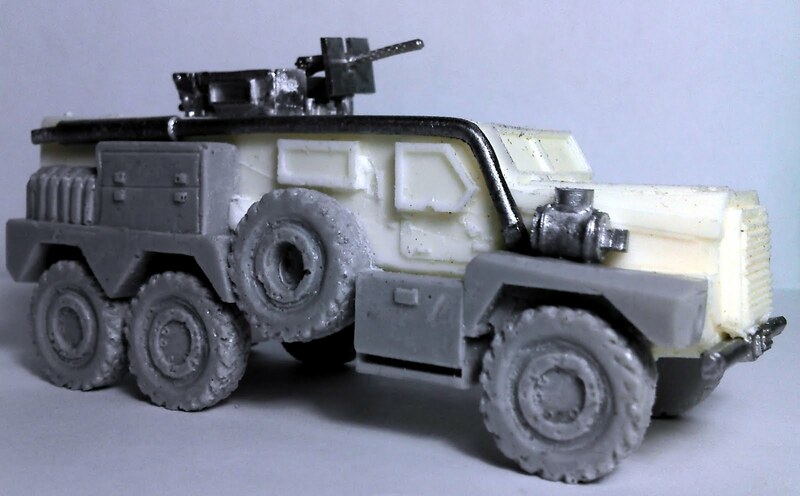 With that in mind I'm working on doing at least some minor conversion work on every miniature that will make up the army. 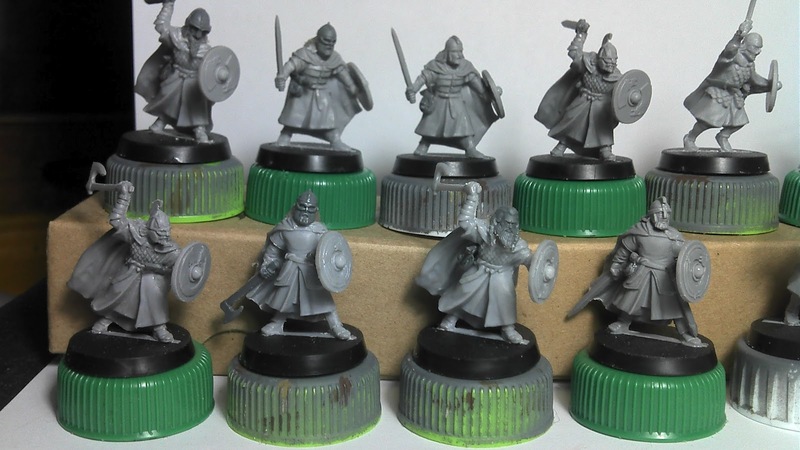 First up is Grimbold's warband made up of 12 Rohan Warriors. These are all plastics from the basic Rohan Warrior box. 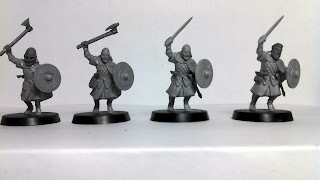 I'm trying to go very wysiwyg with these guys, so no throwing spears or bows, just shields and hand weapons and since the Helmingas prefer the axe to the sword I have swapped out weapons on half the miniatures. 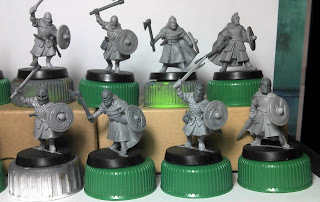 I sacrificed weapons and other interesting bits from a couple of sprues of Hirdmen from Gripping Beast and Bondi from Wargames Factory. I'm not sure I'm happy with all of the head swaps that I made. 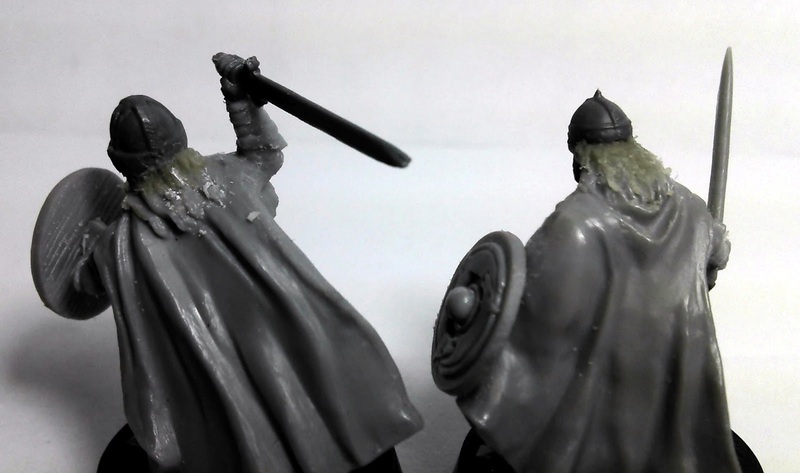 In particular the heads from the Gripping Beast sprues just seem to be to big, the ones from the Wargames Factory sprues look a bit closer to being the right size. Its a little difficult to use these heads to begin with since the GW LoTR figures are much closer to true 25mm miniatures and the Gripping Beast and Wargames Factory are definitely 28mm miniatures. They may look fine after I get them painted up but if I'm going to make any changes I need to do that now since I will need to resculpt the hair before painting them. 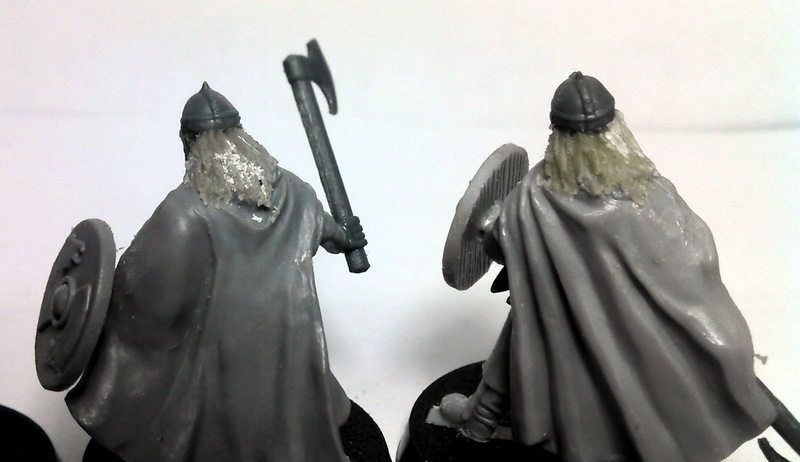 Head swaps are usually the hardest thing to do but they really are a piece of cake with plastic miniatures. The same is true with weapons swaps and in this case I swapped out the whole hand, that was much easier than cutting weapons in two and grafting them on to existing hands. Everything else is just the addition of belt knives and pouches. 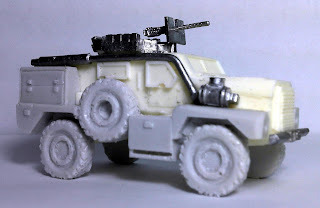 Very minor stuff and very easy to do with plastic miniatures. I have also run into a problem trying to acquire some of the miniatures for this force. A lot of the models particularly the mounted versions of the Rohan Royal Guard are out of production. 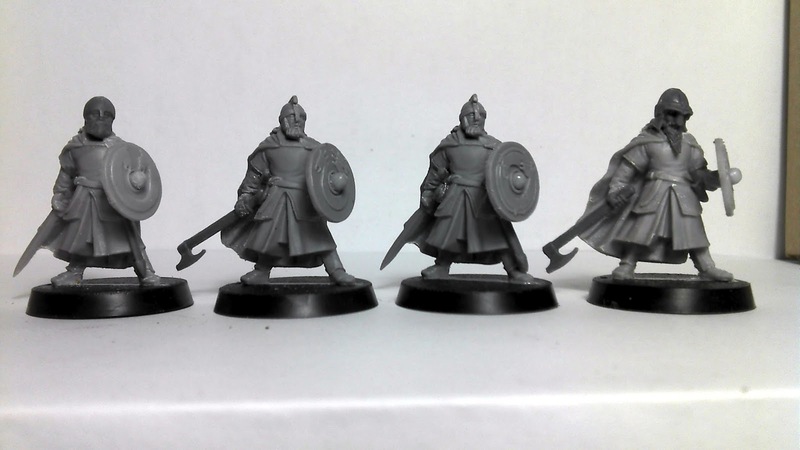 My guess is that they will soon be available in Finecast resin. I don't want to wait that long or spend that much money on them either. 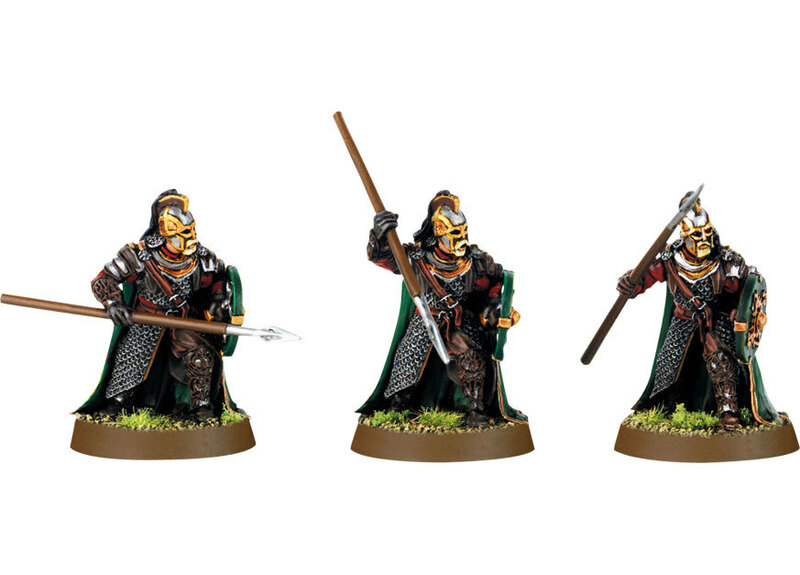 I spent some time looking at images from the movie and determined that there isn't that much difference between the Royal Guard and any other Rohan warrior. The biggest difference is the helmet. Only the Royal Guard have a crest on the helmet with some horsehair flowing off of it. Two of the plastic Riders of Rohan have this style helmet (with the cheek guards). 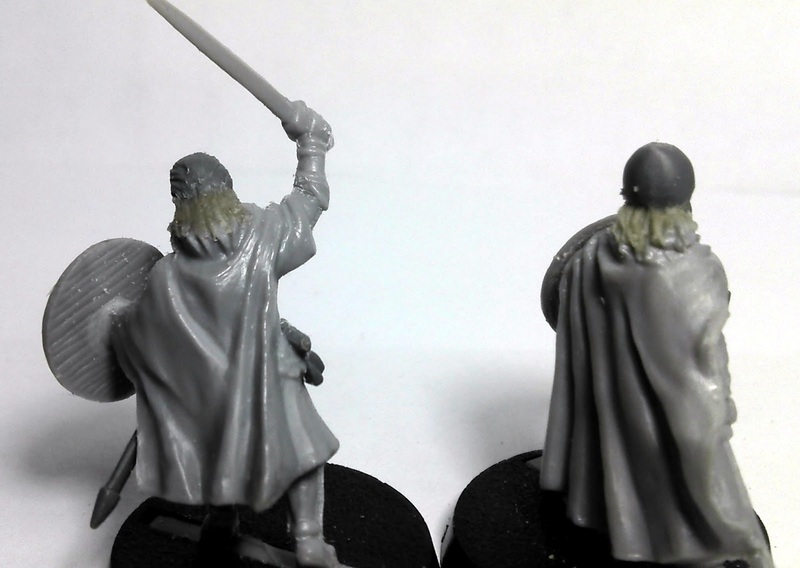 They will take more work but I'm going to use these two riders as the stock models for converting all ten of the mounted Royal Guard that I will need for Eomer's warband. 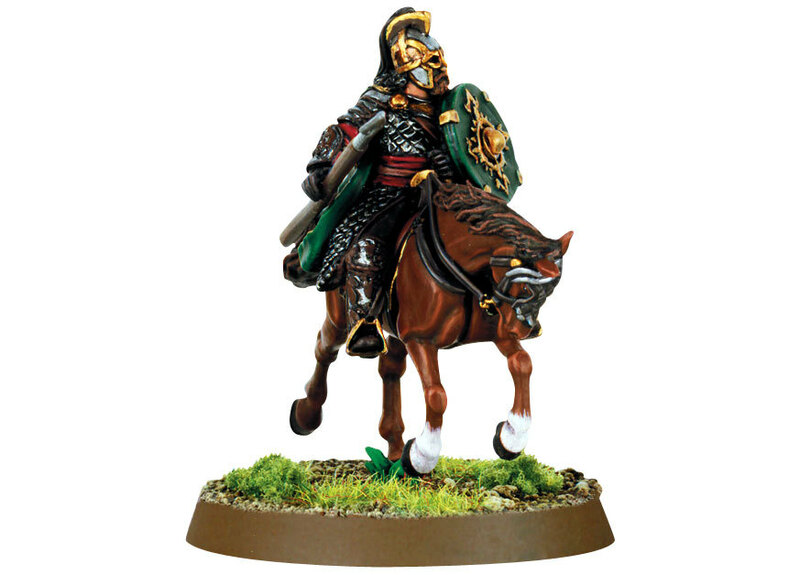 I will probably do a little extra work on the horses to make them stand out a bit more as well as the horse in the Royal Guard blister is the same horse in the Riders of Rohan box. Let me know what you think about the heads. Its definitely not to late to change things out and they are only plastic and I have another box to work with if something doesn't work. At this point the work is going smoothly and I'm on schedule to complete the painting in time for September. My friend Scott, just posted his version of my Face Tutorial over on his blog: http://djokergaming.wordpress.com/ . He does a few things differently but for the most part it is the same, but his has pictures! I think the variations are interesting and its well worth reading. The reality here is that there is nothing truly new in what I’m going to tell you, it is just my version of it. There are no new techniques, these are all things I have gleaned off the internet or been taught by other painters. What I’m really trying to achieve is to bring some of these techniques together in one place. I know there are a lot of steps here and it can look a bit intimidating but once you read it and work your way through it, it quickly becomes second nature. Step 2 - After the base coat has dried, paint over it almost completely with the Tanned Shadow. Again I thin my paint down maybe quiet as much as 1:1 (paint:water) but you still want it thin. 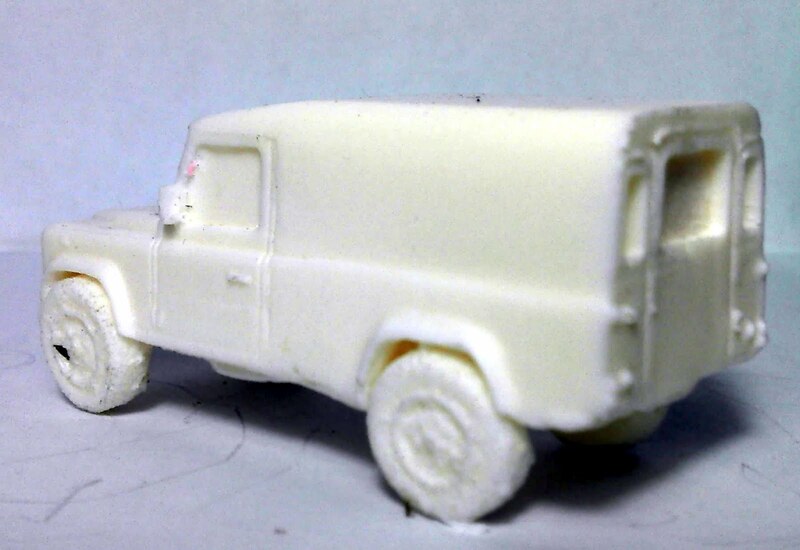 I'm going to stay out of the deeper recesses of the mini and leave those in the basecoat color. Step 3 - At this stage I paint the eyes, if I screw up I know I have more painting to do and can neaten them up as I go. I paint the entire eye with a very dark brown or black (Reaper Walnut Brown is my favorite for this). Be sure you get all the way out to the edges. This is the shadow for the eye. Second step is to take an off white (linen white, very light grays etc) and paint essentially a strip across the eye. You want to cover the dark color with the off white leaving a dark line around the edges. This gives the eyes separation from the face and makes them stand out. I have thinned the white but not nearly at 1:1. Next are the pupils. Typically I use what ever I used to paint the first step in the eye, but any darker color will work, blues are good, some greens will work and deeper browns. Instead of trying to paint a dot I sort of push the tip of the brush up into to eye, so you are not seeing a full circle. Part of it is interrupted by the eyelid (which is normal, look at the people around you and you will see that you really don't see the entire circular pupil, part of it is hidden by the eyelid). It is easier to paint eyes that are looking off to one side. Getting both eyes straight looking straight ahead can be a bit frustrating. Now the eyes are done. NOTE: If the eyes are basically slits, let the wash fill it in, not every miniature has an eye that you can really paint and men in the field tend to squint anyway or the eyes are just plain hard to see if the shako, helmet or hat is pulled down low. 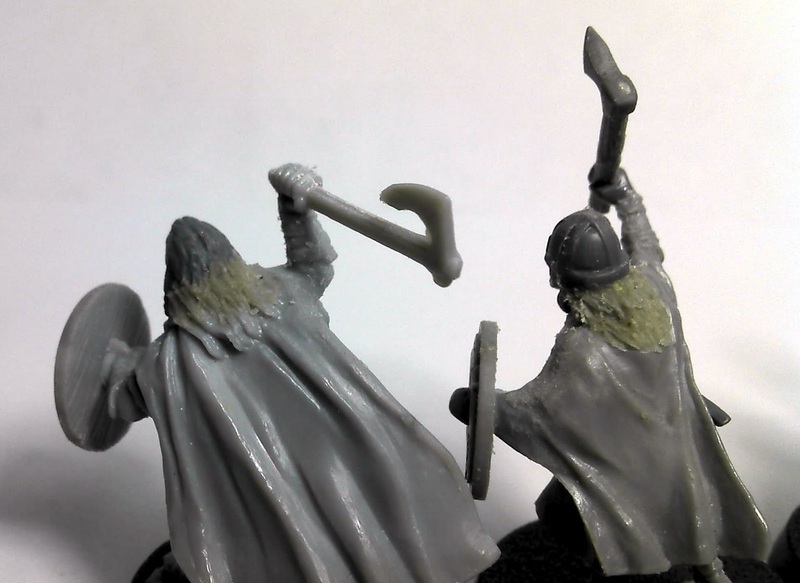 So don't feel like you have to paint the eyes on every one of your miniatures. Just doing it for some of the guys in the front rank will make your stuff stand out. 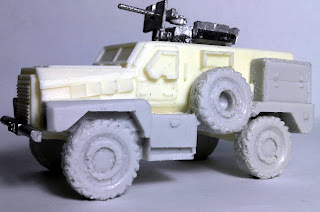 Step 4 – Apply a wash across all the skin with Sepia Wash (GW, wash, but any brown wash will work, warmer is better and if it has a hint of red even better) this warms the skin a bit. 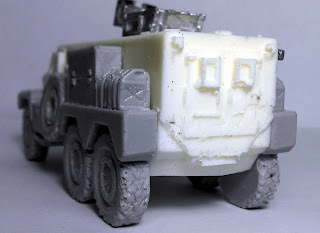 For a cooler skin tone Devlan Mud will work. Just be careful you don't wash over the eyes. Although a quick dab with a dry brush should wick out any of the wash that gets into a bad spot. The wash must be dry before you go to the next step or you will just start to create a muddy effect. You can stop now if you like. 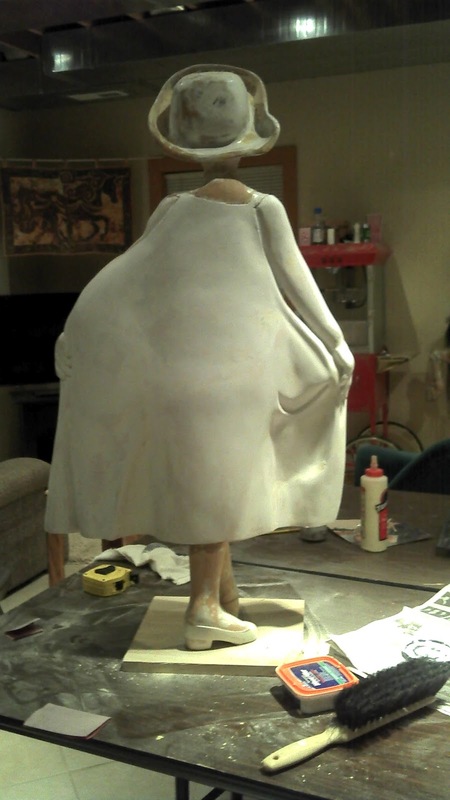 Step 5 - Using the Tanned Skin paint downwards across the skin. You are really painting the areas where more light is hitting, the cheek bones, the nose, the chin, the ears, the tops of the hands. Imagine the light coming straight down from the top of the figure to pick out these areas. 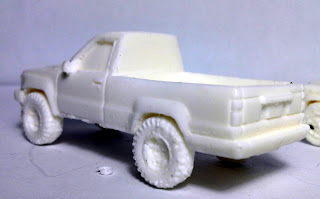 Again, paint should be kept thin, not quite a 1:1 ratio but it should flow off your brush and remain controllable. Again this is a good place to stop if you like it. Step 7. - Glazing. One of the issues when you paint this many layers without a lot of intermediate steps is that it starts to look very blocky even chalky. So a glaze across the entire surface will help tie all the colors back together. A glaze has almost no paint in it so we are something on the order of 1:20 paint to water (so way thinner than a wash). If you put some on your brush and draw it across a piece of paper and if you can barely tell there is color on that line then you are about right. Apply the glaze across all the skin. Optional Step - You can glaze the skin after every application of skin color, not just wait till the last step. This will add a lot more depth to the skin tones when you are done. 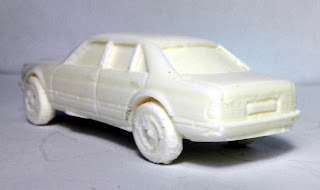 Since the glaze is applied over the whole surface you really won't add a lot of time by doing it. It does need to dry before you apply the next skin color though. 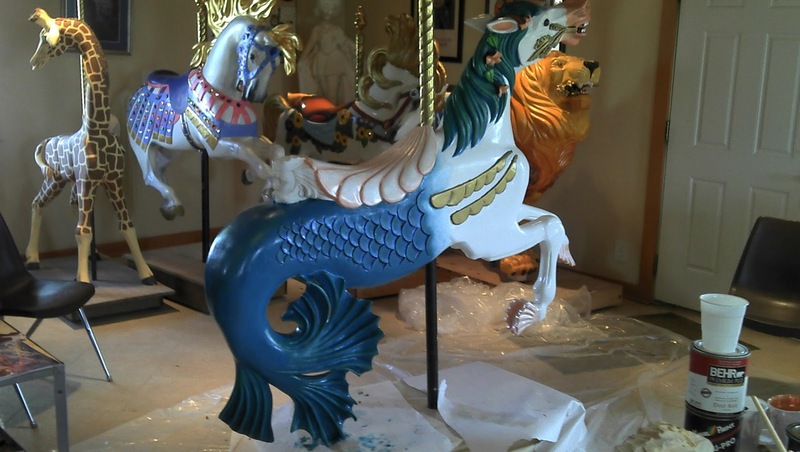 If you are feeling really ambitious after the final glaze you could go back with the final hightlight color one more time and touch just the highpoints again. Some people like this affect some don't. The idea is to sort of add a "reflection" to the skin. So this is one method, it’s the one I use most of the time. I do use a variation of this on my 15s but it’s really more appropriate for 25s and larger. There are other ways to do it and there is really not right or wrong as long as you get the effect you want and are happy in the end. 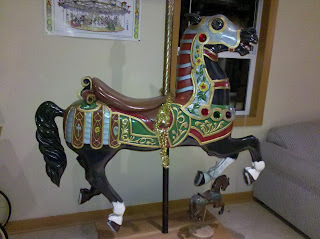 When my Dad carves carousel related items he tries to imitate a particular carver with each piece. For instance the big white horse in full stride is carved in the Parker style. 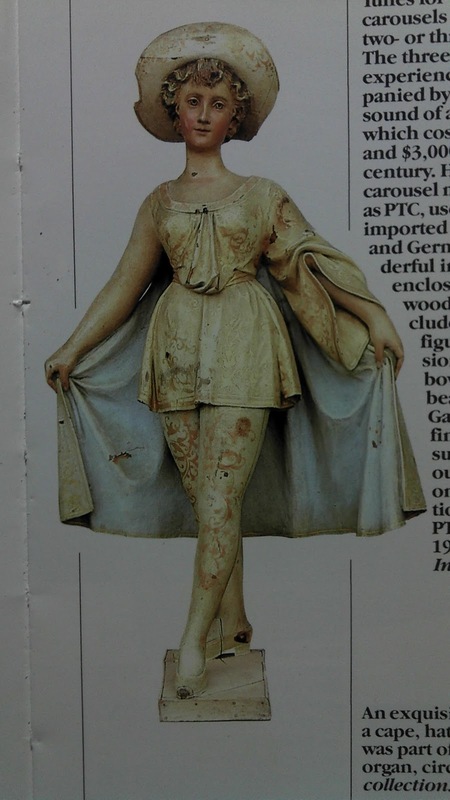 This maiden was part of a Gavioli Band Organ, circa 1910. He's not trying to copy the piece but to give it the same style. 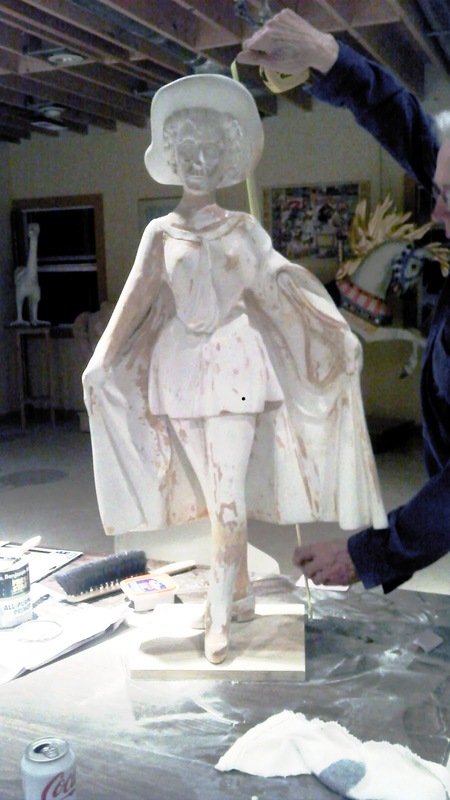 In that vein I will attempt to paint her in the original colors, which will include a lot of flowered lace work. Here are some pictures taken tonight and a picture from the book that he used as a carving reference. 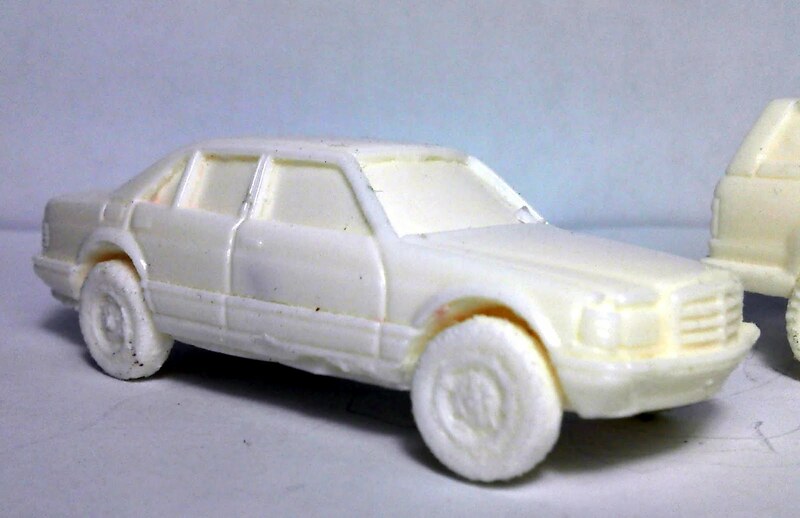 She is obviously not quite ready for painting but I might be able to pick her up next week. 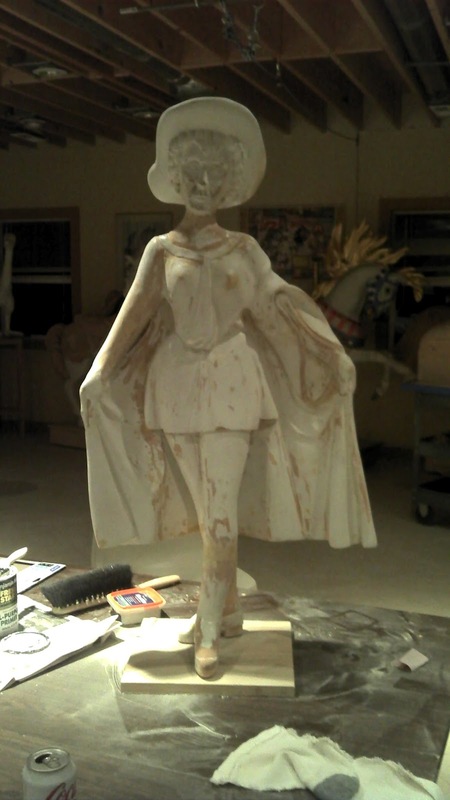 She stands a lot taller than I though, just about 41" tall, so a big piece to be sure. The airbrush will definitely get a workout with this one. When she is ready to paint, everything else will pretty much come to a halt. Well, two days in and I'm likely to fail Anne's challenge of not buying any more minis till 1/4 of what I currently have is completed. But there is a good reason, honest. 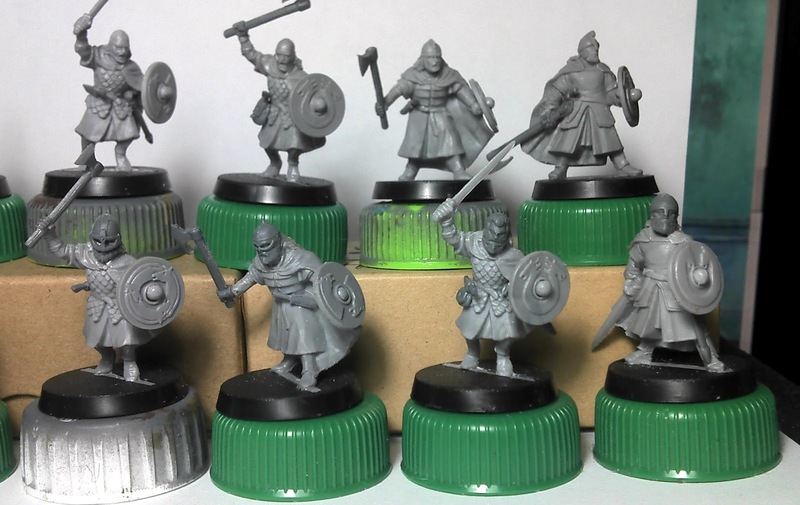 You see I'm in desperate need of minis for my proposed Rohan army which has to be ready by September. 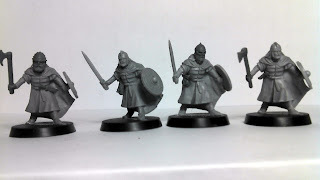 I have kept the numbers low, 35 total miniatures, but to do that I opted for a good portion of Rohan Royal Guard miniatures, well because they are expensive and don't come with bows! Even more expensive when you actually have to buy them. 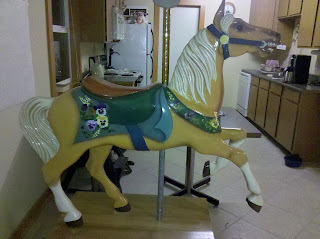 I dug through my stuff and came up with 1 pack of 3 on foot which means I need 6 more on foot and 9 on horseback. So if anybody out there has some of these guys they are willing to give up I'm interested in talking. I'm quite certain that I can come up with something to trade for them if necessary or out right buy them. 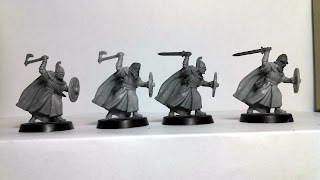 I'm not going with the throwing spear option with these guys so if you have them assembled and have long since tossed the sword arm then I can't use them. 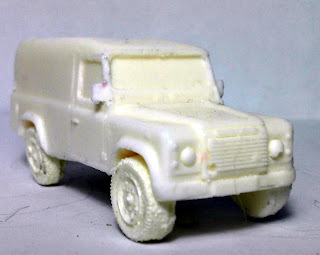 I prefer unpainted because if they are painted then I'm going to strip them back down to bare metal and plastic. Quiet frankly with this list I'm not going to win the tournament or even come close so I'm going to have to go after having the best painted army. I know that these are sitting in one of my many "galleries" but since it I'll be picking up a new piece to work on I thought I would bring them out front for a bit. 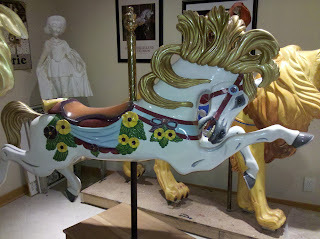 These are full size carousel horses that were carved by my Dad and painted by me. 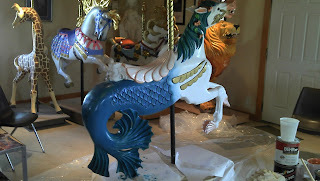 There are another half dozen or so horses and animals in various stages of completion. He has painted one horse, a giraffe (although I did the butterfly) and a lion himself, but painting really isn't his thing. So here are the ones I have done and you can see some of the others in the background. These can be quite relaxing in some ways because I get to use a 2" house brush for most of it, for some reason a size 0 Kolinsky Sable just does not get it done. In this next one you can see the statue that he wants me to paint in the corner. Must be somewhere between 2' and 3' tall. 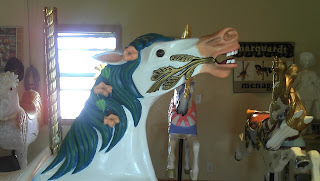 The lion he painted is behind this horse, its not finished yet. 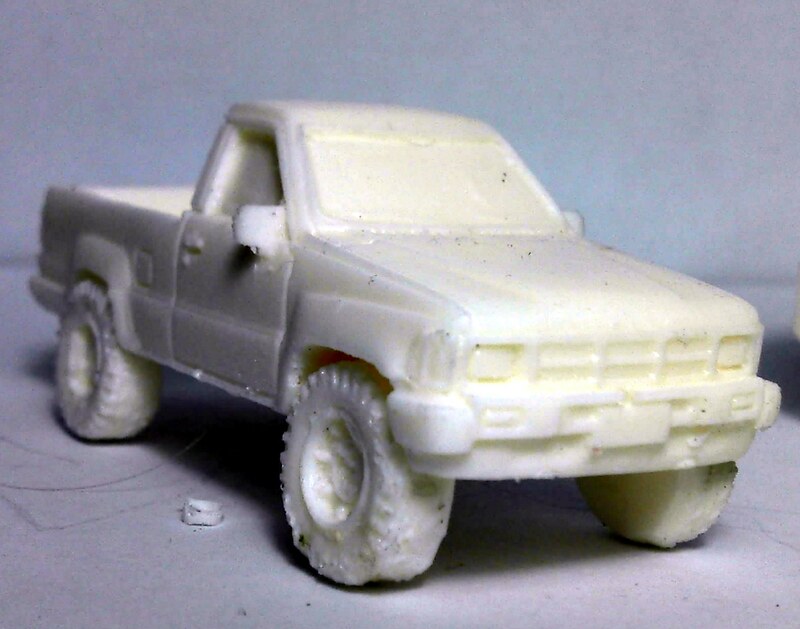 An in process shot. I love being able to paint with a house brush. 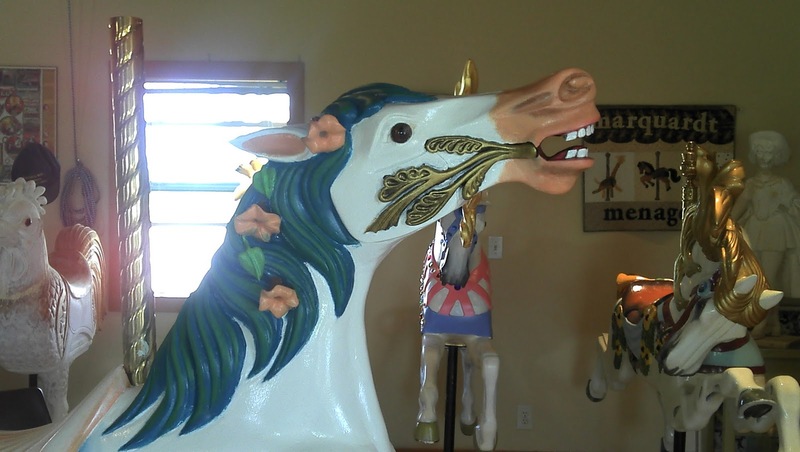 This is the horse my dad painted, the mane is done with gold leaf. You can see the Giraffe's neck on the edge of the picture that he painted. 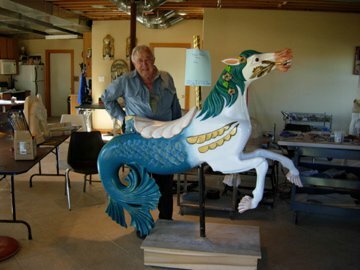 The current horse in the carving stage. So yes, my trains are suffering as well. Currently one half of the ATSF Patch district has track layed but not wired. I need to figure out a way to keep the two hollow core doors tightly together. I was making good progress on rolling stock but I ran out of the Sergeant couplers that I was using. However, just last week a box full of couplers arrived so I have no more excuses about not getting the entire fleet finished up. Its not like I have hundreds of cars, its more like 10 - 12. 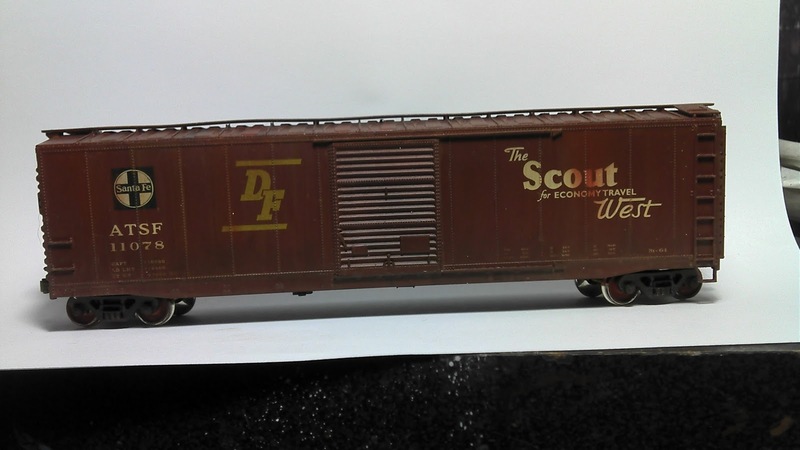 Oh and I would have swore that the two beer cars I got from Exact Rail were 50' and the are actually something over 60'. I'll probably just go ahead and sell those off or trade them. 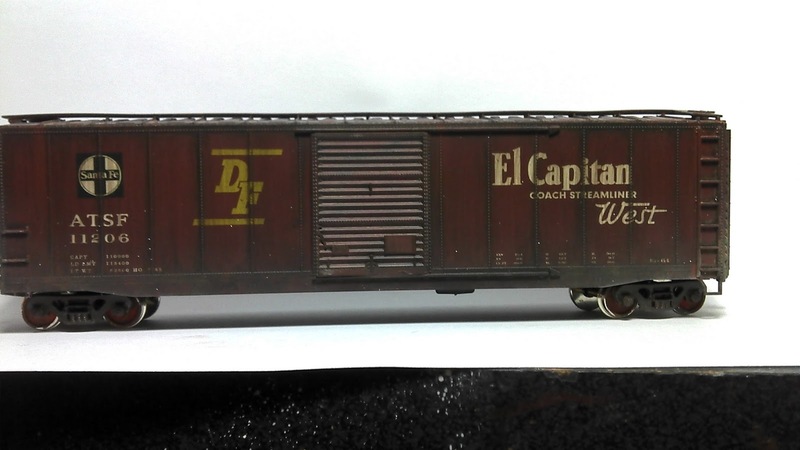 I have five ATSF Reefers that need to be weathered as well as the two CF7s. I have four background building kits to get me started on the rear portion of the layout and a lot of grandiose plans in my head. 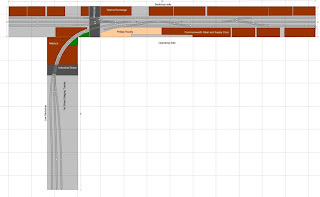 Once the layout is up and in place and the track thoroughly tested things should move right along. Unfortunately I have way to many hobbies and I can't seem to give any of them up. The other layout is in mothballs at the moment. That is my turn of the century Colorado and Northwestern RR. 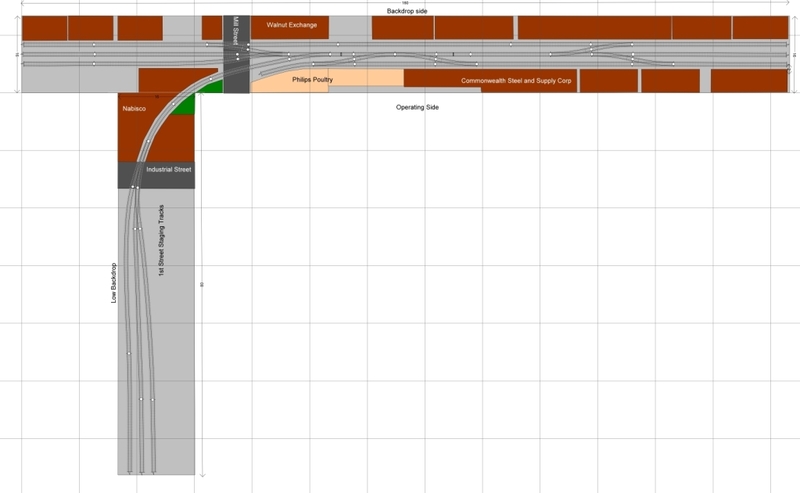 I'm unhappy with the track design so it came down for the time being so that it doesn't frustrate me. 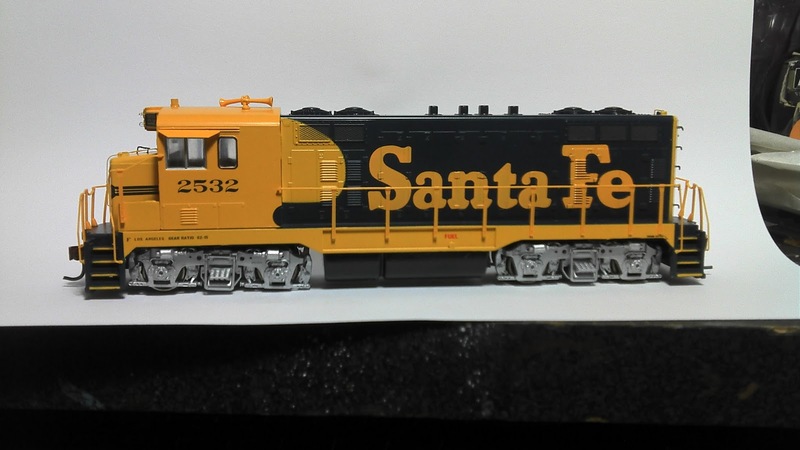 There are about 30 box cars and 20 short gondola cars for that along with 3 2-8-0 (Consolidation), 1 2-6-0 (Mogul) and a two truck Heisler (that really should be a three truck Climax but that was way outside of my price range). 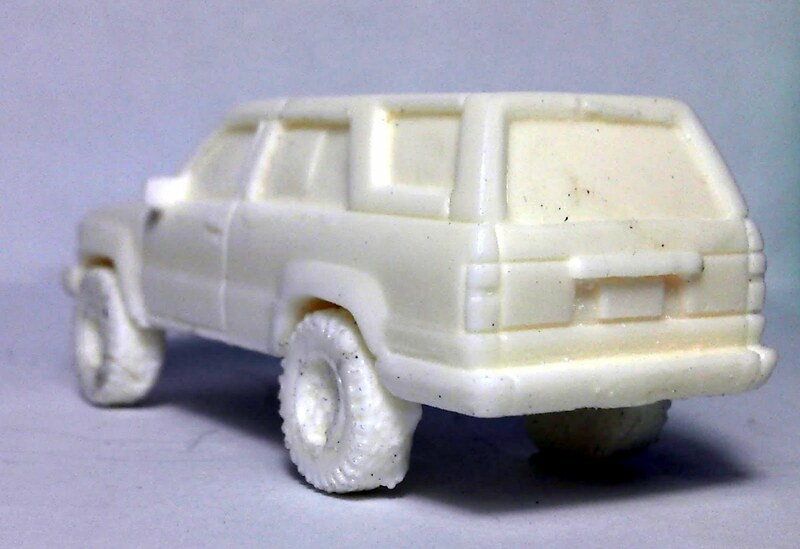 I also need to acquire a 2 truck Shay but I'll see how I feel about that.